Jalen Brunson and Villanova take on the winner of the LIU/Radford game. March Madness is in full swing and NCAA tournament brackets need to be filled out. We've got you covered with summaries for every team playing in the first round of the big dance. Record: 31-2, 17-1 Atlantic Coast, 1st. RPI: 1. Coach: Tony Bennett (12th season, 288-118; 219-88 in nine seasons at Virginia, 10-7 NCAA). Three-pointers: 38.9 percent. Free throws: 75.6. Ty Jerome:10.6 ppg., 3.7 apg. The Cavaliers, who were not ranked in the top 25 in the preseason, finished the regular season as the nation's No. 1 team. They ride their defense, which leads the nation in points allowed (52.8 per game), opponent field-goal percentage (37.5, third) and opponent three-point percentage (29.9, sixth). Guy averages nearly 2.5 threes per game. Virginia guard Kyle Guy drives against North Carolina guard Andrew Platek (3). Record: 24-10, 12-4 America East, 2nd. RPI: 111. Coach: Ryan Odom (3rd season, 53-34; 45-23 in two seasons at UMBC; 0-0 NCAA). Best win: 65-62 vs. Vermont in conference final, March 10. Worst loss: 83-39 at Albany, Jan. 21. Three-pointers: 38.7 percent. Free throws: 64.9. Jairus Lyles: 20.2 ppg., 5.6 rpg., 3.5 apg. K.J. Maura: 11.4 ppg., 5.2 apg. Joe Sherburne: 10.9 ppg., 3.9 rpg. Lyles hit a game-winning three in the conference championship game. He admitted afterward that he "waved off" the play that was sent in by his coach. UMBC's last NCAA bid was in 2008 when it was coached by Philadelphian Randy Monoe, who is currently an assistant at St. Joe's Prep. Record: 21-11, 10-8 Big East, tied for 3rd. RPI: 44. Coach: Greg McDermott (24th season, 467-288; 187-93 in eight seasons at Creighton, 3-7 NCAA). Ronnie Harrell Jr.: 7.4 ppg., 6.5 rpg. The Bluejays are one of the nation's top offensive teams, ranking ninth nationally in scoring (84.8 points per game), 10th in field-goal percentage (49.9) and 12th in three-point baskets (10.6 per game). They lost a key inside player in Martin Krampelj to a season-ending knee injury on Jan. 17. 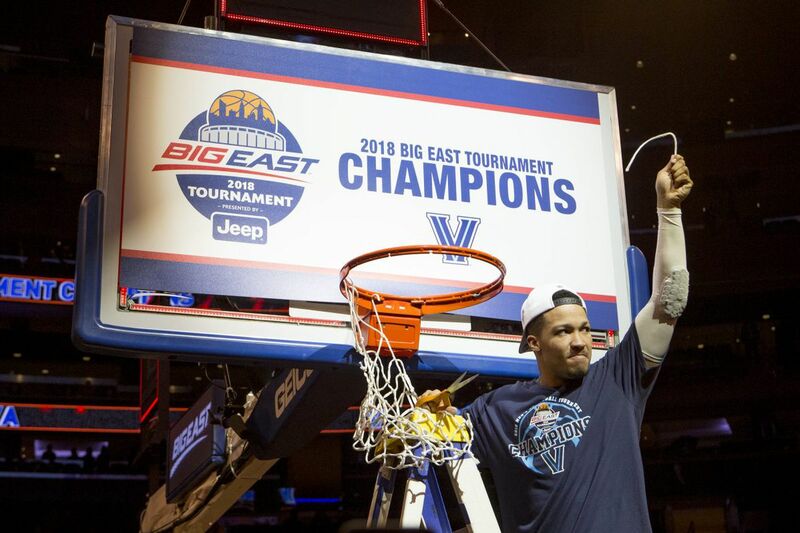 Thomas was named the Big East's defensive player of the year. Record: 22-11, 10-8 Big 12, fourth. RPI: 53. Coach: Bruce Weber (20th season, 435-234; 122-79 in six seasons at Kansas State; 12-11 NCAA). Best win: 73-68 vs. TCU, Jan. 20. Worst loss: 89-51 at West Virginia, Feb. 3. Three-pointers: 35.1 percent. Free throws: 74.7. Dean Wade: 16.7 ppg., 7.4 rpg., 2.8 apg. Barry Brown Jr.: 16.6 ppg., 3.1 rpg., 3.5 apg. Xavier Sneed: 10.7 ppg., 4.8 rpg. The Wildcats were 0-7 against the top three teams in the Big 12 – Kansas, Texas Tech and West Virginia. Teams with size hurt the Wildcats, as they were last in the Big 12 during the regular season in rebounding margin (-3.2) and in blocked shots (3.0 per game). Point guard Kamu Stokes, who missed seven games with a foot injury, is back but was still rounding into form as the regular season ended. Record: 24-10, 10-8 Southeastern, 4th. RPI: 10. Coach: John Calipari (26th season, 676-201; 273-63 in nine seasons at Kentucky; 51-17 NCAA). Three-pointers: 34.8 percent. Free throws: 69.5. Kevin Knox: 15.7 ppg., 5.3 rpg. Shai Gilgeous-Alexander: 13.2 ppg., 3.8 rpg., 4.9 apg. Hamidou Diallo: 10.4 ppg., 3.7 rpg. Quade Green, a freshman from Philly's Neumann-Goretti High, had been a starter until back spasms sidelined him for three games in January. Gilgeous-Alexander, another freshman, took his place in the lineup and has been arguably one of UK's best players. The Wildcats are 10-3 when Green starts and 11-7 — mostly against tougher SEC competition — when he does not. Kentucky starts four freshmen and a sophomore. The Wildcats have been to four Final Fours and two Elite Eights in the seven NCAA tournaments they've played under Coach Cal. They won it in 2012. Record: 21-11, 13-5 Atlantic Ten, 3rd. RPI: 47. Coach: Bob McKillop (553-339 in 29 seasons at Davidson; 3-8 NCAA). Best win: 63-61 vs. Rhode Island, March 2. Worst loss: 78-62 at Appalachian State. Nov. 25. Three-pointers: 38.4 percent. Free throws: 79.8. Peyton Aldridge: 21.3 ppg., 7.8 rpg. Kellan Grady: 17.9 ppg., 3.3 rpg. Jon Gudmundson: 13.4 ppg. 6.1 rpg. 5.1 apg. The Wildcats locked up their first Atlantic Ten Tournament title since joining the league in 2014 by upsetting 25th Rhode Island. Aldridge was named A-10 Co-Player of the Year while Grady was the Rookie of the Year. Grady is Davidson's top scoring freshman since Stephen Curry. Gudmundson, who is from Iceland, is one of five NCAA player in the last 25 year to average 13 points, 6 rebounds and five assists while shooting 40 percent on three-pointers. Record: 27-7, 13-4, PAC 12, 1st. RPI: 13. Coach: Sean Miller (13th season, 373-119; 224-66 in 16 seasons at Arizona; 20-10 NCAA). Best win: 67-64 vs. Texas A&M, Dec. 5. Worst loss: 74-72 at Marquette, Jan. 24. Three-pointers: 38.4 percent. Free throws: 76.4. Deandre Ayton: 19.9 ppg., 11.4 rpg., 1.6 apg. Allonzo Trier: 18.9 ppg., 3.2 rpg., 3.3 apg. Rawle Alkins, 13.7, 4.6 rpg., 2.7 apg. The Wildcats have endured a season riddled with controversies, but they come out on the other side with all-Pac-12 players Deandre Ayton and Allonzo Trier both on the floor for the dance. Therefore, they'll be one of the favorites to cut the final nets. Record: 26-8, 15-3, Mid-American, 1st. RPI: 25. Coach: Nate Oats (3rd season, 63-38; 63-38 in 3 season at BUFFALO; 0-1 NCAA). Best win: 104-94 vs. Toledo, Jan. 2. Worst loss: 90-88 at Northern Illinois, Feb. 10. Three-pointers: 36.9 percent. Free throws: 69.4. C.J. Massinburg: 17.4 ppg., 7.5 rpg., 2.5 apg. Nick Perkins: 16.7 ppg., 6.2 rpg., .8 apg. Jeremy Harris: 15 ppg., 5.7 rpg., 2.3 apg. Buffalo is back in the tournament after missing the dance last season, which snapped a two-season streak. At 6-foot-3, junior guard C.J. Massinburg leads the team in scoring, rebounding and is second in assists. Record: 22-9, 11-7 Atlantic Coast, tied for 3rd. RPI: 28. Coach: Jim Larranaga (34th season, 631-412; 161-78 in eight seasons at Miami, 9-8 NCAA). Three-pointers: 36.5 percent. Free throws: 66.6. Dewon Huell: 11.6 ppg., 6.6 rpg. Lonnie Walker IV: 11.6 ppg. Anthony Lawrence: 8.8 ppg., 6.6 rpg. The Hurricanes won their last four regular-season games by a total margin of eight points, and are 9-6 in ACC games decided by less than 10 points. Walker, a freshman from Reading, averaged a team-high 13.7 points in ACC play. Senior guard JaQuan Newton, a Neumann-Goretti High product, is one of five players in program history with 1,100 points and 300 assists. Record: 28-5, 15-3 Missouri Valley, 1st. RPI: 22. Coach: Porter Moser (14th season, 222-211; 117-110 in seven seasons at Loyola; 0-0 NCAA). Three-pointers: 39.8 percent. Free throws: 72.4. Clayton Custer: 13.4 ppg., 4.3 apg., 44.0 3pct. Donte Ingram: 11.6 ppg., 6.5 rpg. Marques Townes: 11.2 ppg., 40.3 3pct. They have a high Cinderella potential. Five players average double figures. All can shoot, and all are above-average passers. They won at Florida when Aundre Jackson, the team's fourth-leading scorer, had 23 points. The Ramblers are in the NCAAs for the first time since 1985 when they lost to Patrick Ewing and Georgetown. Marques Townes was a teammate of NBA star Karl-Anthony Towns at St. Joseph's High in Metuchen, N.J. Loyola won the 1963 national title by beating Cincinnati in overtime. Record: 25-8, 13-5 Southeastern, 2nd. RPI: 8. Coach: Rick Barnes (31st season, 660-357; 56-43 in three seasons at Tennessee; 21-22 NCAA). Three-pointers: 38.1 percent. Free throws: 75.8. Grant Williams: 15.6 ppg., 5.8 rpg., 1.4 bpg. Admiral Schofield: 13.5 ppg., 6.1 rpg. Lamonte Turner: 10.6 ppg., 91.2 ftpct. They played the toughest schedule in D-I and beat Purdue and North Carolina State in the Bahamas in November but lost to Villanova. They went 8-4 in true road games. Admiral Schofield was born in the same English hospital Princess Diana gave birth to princes Harry and William. Schofield's father, Anthony, is a retired senior chief of the U.S. Navy. Sophomore Grant Williams was the SEC player of the year, the first Vols underclassman to win league MVP since Bernard King in 1976. Tennessee forward Grant Williams (2) drives the ball around Florida forward Kevarrius Hayes (13). Record: 25-9, 14-4 Horizon, 2nd, won conference tournament. RPI: 99. Coach: Scott Nagy (10th season, 212-119; 45-21 in second season at Wright State; 0-3 NCAA). Best win: 74-57 over Cleveland State in the Horizon championship, March 6. Worst loss: 66-56 at IUPI (Indiana U, Purdue U, Indianapolis), Feb. 23. Three-pointers: 34.2 percent. Free throws: 71.7. Loudon Love: 12.9 ppg., 9.8 rpg. Grant Benzinger: 14.5 ppg., 5.4 rpg. Mark Hughes: 9.9 ppg., 3.1 rpg., 2.9 apg. Benzinger scored 19 points in the Horizon League championship win over Cleveland State. The Raiders who had some early injuries and began the year 0-3, led the Horizon League in scoring defense, allowing 65.7 points per game. Loudon Love, the 6-9, 275-pound center, was the Horizon League freshman of the year who also led the league in rebounding. The is the school's third NCAA Tournament appearance and first since 2007. Record: 27-7, 15-3 Mountain West, 1st. RPI: 17. Coach: Eric Musselman (79-28 in three seasons at Nevada; 0-1 NCAA). Best win: 88-81 vs. Rhode Island, Nov. 13. Worst loss: 66-64 vs. San Francisco, Dec. 23. Three-pointers: 33.3 percent. Free throws: 71.6. Ricky McGill: 13.7 ppg., 5.6 apg. Roland Griffin: 10.3 ppg., 5.1 rpg., 51.5 fgpct. E.J. Crawford: 13.1 ppg., 3.5 rpg. With a scoring average (83.5 ppg.) that ranks 17th in the nation, the Wolfpack can put a lot of points on the board and that makes for a dangerous "dark horse." Martin and Kendall Stephens both have attempted over 200 three-pointers while shooting better than 43 percent on them. Nevada has been in the Top 25 since week five. Record: 19-14, 8-10 Big 12, 9th. RPI: 51. Coach: Shaka Smart (ninth season, 213-105; 50-49 in third season at Texas; 7-6 NCAA). Best win: 67-58 vs. Texas Tech, Jan. 17. Worst loss: 86-51 at West Virginia, Jan. 20. Three-pointers: 31.6 percent. Free throws: 66.6. Mohamed Bamba: 13.0 ppg., 10.6 rpg., 3.82 bpg. Dylan Osetkowski: 13.7 ppg., 7.2 rpg. Kerwin Roach II: 12.3 ppg., 3.6 rpg., 3.6 apg. Center Mohamed Bamba, the 6-11 freshman standout from Westtown School, returned for the conference tournament after missing nine games due to a sprained left toe. He was second nationally in the regular season in blocked shots (3.82 per game). Texas was helped by playing a difficult schedule, going 5-7 against AP Top 25 teams. Texas played in seven overtime games and was 3-4. Record: 30-4, 16-2 American, 1st. RPI: 6. Coach: Mick Cronin (15th season, 336-163; 267-139 in 11 seasons at Cincinnati; 5-9 NCAA). Best win: 62-61 at Wichita State, March 4. Worst loss: 89-76 at Xavier, Dec. 2. Three-pointers: 36.7 percent. Free throws: 69.4. Jacob Evans: 13.5 ppg., 4.5 rpg., 3.3 apg. Gary Clark: 12.7 ppg., 8.2 rpg., 1.2 bpg. Kyle Washington: 11.2 ppg., 5.4 rpg., 1.3 bpg. The Bearcats were second in the nation during the regular season in scoring defense, allowing 57.3 points per game and first nationally in scoring margin (18.9 per game). … Cincinnati struggles offensively and isn't a good free throw shooting team, so the best way to contain the Bearcats is not allow them to score in transition or on points off turnovers. … Few teams play with more toughness than the Bearcats, who had two first-team all-conference choices in Clark and Evans. Record: 24-10, 12-6 Sun Belt, 2nd. RPI: 120. Coach: Ron Hunter (20th season, 368-263; 147-84 in seven seasons at Georgia St.; 0-3 NCAA). Three-pointers: 38.6 percent. Free throws: 67.2. D'Marcus Simonds: 20.9 ppg., 5.8 rpg., 4.5 apg. Simonds set the GSU record with 718 points and was the league's player of the year. He dropped 27 in Sunday's championship. Hunter, the coach, might be best known for tearing his Achilles' in 2015, the last time the Panthers made it to the NCAAs. Record: 28-5, 15-3 Big East, 1st. RPI: 3. Coach: Chris Mack (9th season, 214-96, all at Xavier; 10-7 NCAA). Three-pointers: 37.2 percent. Free throws: 78.5. Trevon Bluiett: 19.4 ppg., 5.6 rpg. Quentin Goodin: 9.0 ppg., 5.0 apg. The Musketeers won 12 of their last 13 games in the regular season, with their only loss coming to Villanova. They rank 10th in the nation in scoring at 84.5 points per game. Bluiett, only the 13th player in Big East to make first-team all-conference three straight years, shoots 85.4 percent on free throws and averages 3.1 three-pointers per game. Trevon Bluiett of Xavier . Record: 15-19, 12-6 Southwestern, tied for 2nd. RPI: 222. Coach: Mike Davis (17th season, 363-240; 114-88 in six seasons at Texas Southern; 7-8 NCAA). Best win: 88-79 vs. Prairie View A&M, March 9. Worst loss: 85-80 vs. Jackson State, Jan. 13. Three-pointers: 35.6 percent. Free throws: 71.5. Demontrae Jefferson: 24.1 ppg., 4.3 apg. Donte Clark: 18.7 ppg., 5.4 rpg. The Tigers are in the NCAA tournament for the fourth time under Davis, who led Indiana to the 2002 Final Four. With a non-conference schedule that included ranked teams Kansas, Clemson, Ohio State and Gonzaga, they started their season 0-13, and are the first team to make the NCAAs with that record, according to Elias. Jefferson, a 5-foot-7 sophomore, hit 79 threes and shot 40.7 percent from deep. Record: 19-15, 9-7 Mid-Eastern Athletic, 6th. RPI: 279. Coach: LeVelle Moton (8th season, 164-96, all at UNCC; 0-2 NCAA). Worst loss: 102-79 at South Carolina St., Feb. 24. Three-pointers: 33.9 percent. Free throws: 68.7. Raasean Davis: 15.0 ppg., 8.0 rpg., 58.9 ftpct. Pablo Rivas: 11.8 ppg., 6.9 rpg. Jordan Perkins: 8.4 ppg., 5.4 apg. Second NCAA appearance in three years and second time in a play-in game. Moton, who earned the nickname "Poetry in Moton" when he was starring for UNCC from 1992-96, said this berth is special because "a lot of people gave up on this team." Sound familiar? Interestingly, its nickname is the Eagles. Record: 20-12, 10-8 Southeastern, 5th. RPI: 43. Coach: Cuonzo Martin (10th season, 186-122; 20-12 in one season at Missouri; 3-2 NCAA). Three-pointers: 38.7 percent. Free throws: 73.7. Kassius Robertson: 16.5 ppg., 2.4 apg., 42.8 3pct. Jordan Barnett: 14.1 ppg., 6.0 rpg., 89.0 ftpct. Jontay Porter: 9.8 ppg., 6.8 rpg. Highly regarded freshman Michael Porter Jr. played 23 minutes in Missouri's SEC tournament loss, his first action since sustaining a back injury after just two minutes in the season opener. He's a consensus top-5 NBA pick this June. Jontay Porter is Michael's brother. Dad, Michael Sr., is an assistant for the Tigers. Missouri's record the last three years is 9-23, 10-21 and 8-24 last season. That's when they turned to Martin, who had been the coach at Cal. Robertson scored 1,236 points in four seasons at Canisius, the only school that had offered him a scholarship out of high school. He was the nation's highest- scoring graduate transfer entering the first week of March. Record: 20-11, 9-9 Atlantic Coast, tied for 8th. RPI: 54. Coach: Leonard Hamilton (30th season, 502-417; 302-207 in 16 seasons at Florida State; 7-8 NCAA). Three-pointers: 35.0 percent. Free throws: 68.8. Terance Mann: 13.3 ppg., 5.7 rpg. Phil Cofer: 13.2 ppg., 5.2 rpg. The Seminoles went 11-1 in their non-conference schedule but had defensive issues in ACC games, allowing an average of 80.6 points. Mann is fourth in the conference in field goal percentage (56.3) and Angola ranks sixth in free-throw percentage (84.5). Sophomore guard Trent Forrest leads the team with 3.9 assists per game and his 2.31 assist-turnover ratio is fourth in the ACC. Record: 24-8, 15-3 Big Ten, 3rd. RPI: 20. Coach: Chris Holtmann (7th season, 138-93; 24-8 in 1st season at Ohio State; 4-3 NCAA). Best win: 64-63 at Purdue, Feb. 7. Worst loss: 79-56 at Penn State, Feb.15. Three-pointers: 35.3 percent. Free throws: 72.6. Keita Bates-Diop: 19.4 ppg., 8.8 rpg. Jae'sean Tate: 12.5 ppg. 6.2 rpg., len Brunson: 14.8 ppg., 4.3 apg. C.J. Jackson: 12.2 ppg., 3.9 apg., 3.8 rpg. Predicted by most to finish in the bottom part of the Big Ten, the 17th-ranked Buckeyes started 10-3 and won their first nine in the conference. Redshirt junior forward Keita Bates-Diop returned from injury in 2016-17 with a vengeance by averaging 19.4 points, 8.8 rebounds and 1.7 blocks. Holtmann jumped to Ohio State after taking Butler to the NCAA's three straight seasons (2015-17). The Buckeyes were 0-4 against non-conference teams in Top-50 RPI. Record: 28-6, 13-1 Summit, 1st place. RPI: 37. Coach: T.J. Otzelberger (2nd season, 46-23; 0-1 NCAA). Best win: 97-87 vs. South Dakota in conference final. Three-pointers: 40.3 percent. Free throws: 76.0. Mike Daum: 23.8 ppg., 10.4 rpg., 42.1 3pct. David Jenkins Jr.: 16.1 ppg., 3.3 rpg. Reed Tullinghuisen: 12.0 ppg., 4.7 rpg. Daum, a junior, has been the league's player of the year twice and the conference tourney MVP three times. He scored 51 in a game last year. Jenkins was the Summit's freshman of the year. He had 29 in the title game. Non-conference losses include Kansas, Wichita State and Colorado in double overtime. The Jackrabbits beat Iowa and Ole Miss. Record: 30-4, 17-1 West Coast, 1st. RPI: 21. Coach: Mark Few (19th season, 533-117, all at Gonzaga; 26-18 NCAA). Best win: 86-59 vs. Ohio State, Nov. 24. Worst loss: 72-70 vs. San Diego State, Dec. 21. Three-pointers: 37.4 percent. Free throws: 72.2. Johnathan Williams: 13.5 ppg., 8.3 rpg. Killian Tillie: 13.4 ppg., 6.0 rpg. Josh Perkins: 12.4 ppg., 5.4 apg. The national runners-up last season, the Bulldogs made it 19-for-19 in NCAA tournament appearances under Few after another WCC tournament title. They have six players who average from 9.5 to 13.5 points per game. As a team, their 84.5-point average is 11th in the nation. Perkins leads the team with 80 three-pointers and shoots 40.8 percent from beyond the arc. Pepperdine guard Jade Smith (5) and Gonzaga forward Johnathan Williams go after a rebound. Record: 27-7, 15-3 Southern, 1st. RPI: 65. Coach: Wes Miller (112-109 in 7 seasons at UNC Greensboro; 0-0 NCAA). Best win: 81-76 at NC State, Dec. 6. Worst loss: 74-72 at Presbyterian. Three-pointers: 35.8 percent. Free throws: 70.1. Francis Alonso: 15.6 ppg., 3.0 apg., 41.0 three-point pct. Marvin Smith: 12.3 ppg., 5.4 rpg. James Dickey: 8.9 ppg. 8.3 rpg. The Spartans won the regular and then reaffirmed their spot by beating East Tennessee State in the Southern Conference tournament final. UNC Greensboro returns to the NCAA tournament for the first time since 2001. The Spartans play strong defense and rank sixth in the country in points allowed (62.4 ppg.). Record: 26-7, 14-4 American, 3rd. RPI: 18. Coach: Kelvin Sampson (25th season, 507-274: 82-47 in four seasons at Houston; 12-14 NCAA). Best win: 67-62 vs. Cincinnati, Feb. 15. Worst loss: 81-72 at Tulane, Jan. 17. Three-pointers: 39.1 percent. Free throws: 71.3. Rob Gray: 18.1 ppg., 4.6 apg. Corey Davis Jr., 13.4 ppg., 3.1 rpg. Devin Davis: 10.7 ppg., 6.2 rpg. This is the fourth team that Sampson has taken to the NCAA tournament, after also guiding Washington State, Oklahoma and Indiana. Few teams play as hard as the Cougars, who were second in the AAC in the regular season in scoring offense (78 ppg.) and fourth in scoring defense (65.2 ppg.). Houston, which will be making its first NCAA appearance since 2010, doesn't have great size, but the Cougars do a great job on the boards and were second in the AAC in rebounding marging (+7.7) in the regular season. Record: 23-10, 11-7 in Mountain West, 4th. RPI: 62. Coach: Brian Dutcher (23-10 in one season at San Diego State; 0-0 NCAA). Best win: 82-75 vs. New Mexico in conference final, March 10. Worst loss: 83-58 at then-No. 23 Nevada, 83-58. Three-pointers: 33.9 percent. Free throws: 72.1. Malik Pope: 12.9 ppg., 6.6 rpg. Devin Watson: 12.3 ppg., 3.3 apg. Trey Kell: 10.4 ppg. 4.1 rpg., 4.0 apg. Kell scored 28 as the Aztecs beat New Mexico to win the Mountain West Tournament. After 18 years as an assistant to Steve Fisher at Michigan and San Diego State, Dutcher is in the NCAAs in his first season as a head coach. He'd been the head coach in waiting at SDSU since 2011. The Aztecs have five players averaging at least 10.2 ppg. Record: 28-7, 13-5 Big Ten, 4th. Big Ten tournament champion. RPI: 12. Coach: John Beilen (36th season, 794-460; 243-142 in 11 seasons at Michigan; 19-11 NCAA). Best win: 82-72 at Michigan State, Jan. 13. Worst loss: 61-52 at Northwestern, Feb. 6. Three-pointers: 36.9 percent. Free throws: 65.9. Mortiz Wagner: 14.5 ppg., 7.1 rpg., .529 FG pct. Muhammad-Ali Abdur-Rahkman: 12.6 ppg., 3.3 apg. Charles Matthews: 12.6 ppg., 5.4 rpg., 2.2 apg. Record: 26-7, 16-2 Big Sky, 1st. RPI: 76. Coach: Travis DeCuire (83-48 in four seasons at Montana; 0-0 NCAA). Best win: 88-79 at Northern Colorado, Feb. 1. Worst loss: 71-68 at Georgia State, Dec. 9. Three-pointers: 33.1 percent. Free throws: 70.07. Ahmad Rorie: 16.9 ppg., 3.7 apg. Michael Oguine: 15.3 ppg., 5.5 rpg. Jamar Akoh: 14.0 ppg., 6.5 rpg., 1.5 bpg. The Grizzlies did not have the strongest out-of-conference schedule (312) and did not do well with it. Montana was 0-3 against teams with an RPI lower than 90 and 3-7 against teams with one lower than 150. The Big Sky is loaded with teams that have RPIs worse than 150, and the Grizzlies feasted on them during the regular season and conference tournament. Rorie was first-team All-Big Sky and Oguine was Defensive Player of the Year. Record: 20-12, 9-9 Southeastern, 8th. RPI: 29. Coach: Billy Kennedy (20th season, 346-276; 135-97 in seven seasons at Texas A&M; 3-3 NCAA). Three-pointers: 32.9 percent. Free throws: 66.4. Tyler Davis: 14.7 ppg., 8.7 rpg., 58.2 fgpct. Admon Gilder: 12.1 ppg., 4.2 rpg. D.J. Hogg: 11.4 ppg., 5.3 rpg. The Aggies started 11-1 and climbed to No. 5 in the AP poll. Then opened league play with five losses that included some injuries and a three-game suspension for Hogg for a violation of team rules. Freshman guard T.J. Starks was averaging 14.2 points entering the SEC tournament since becoming a starter in late January. Robert Williams, a 6-foot-10 sophomore, is projected as a mid-first-round NBA pick if he comes out. Williams was the SEC defensive player of the year last season and shared the award this season. Record: 21-13, 10-8 Big East, tied for 3rd. RPI: 32. Coach: Ed Cooley (12th season, 236-162; 144-93 in seven seasons at Providence, 1-4 NCAA). Three-pointers: 34.6 percent. Free throws: 70.0. Rodney Bullock: 14.1 ppg., 5.8 rpg. Alpha Diallo: 12.3 ppg., 6.4 rpg. Kyron Cartwright: 11.4 ppg., 5.8 apg. The Friars were the only team in the league to defeat both Xavier and Villanova, with both wins coming at home. They lead the Big East in three-point defense (32.4 percent) and gave up only three three-pointers (in 20 attempts) to Villanova, the conference's most prolific team from deep. Cartwright led the Big East in assists while the 6-7 Diallo can guard multiple positions. Record: 25-10, 11-7 Atlantic Coast, tied for 3rd. RPI: 4. Coach: Roy Williams (30th season, 841-226; 423-125 in 15 seasons at North Carolina, 76-24 NCAA). Three-pointers: 37.1 percent. Free throws: 73.6. Joel Berry II: 17.8 ppg. Luke Maye: 17.7 ppg., 10.1 rpg. Theo Pinson: 9.9 ppg., 6.1 rpg., 4.7 apg. The Tar Heels played the toughest schedule in the country when measuring the RPI of their opponents. Maye shoots 51.1 percent from the field and Berry is making 87.6 percent of his free throws. The Tar Heels did not defend the three-point line very well during the season. Opponents made just over 10 per game and shot 38.6 percent. Record: 23-9, 10-4 Atlantic Sun, 2nd. RPI: 101. Coach: Casey Alexander (seventh season, 108-111; 84-75 in five seasons at Lipscomb; 0-0 NCAA). Best win: 108-96 over top-seeded Florida Gulf Coast in the Atlantic Sun championship, March 4. Worst loss: 102-96 at North Florida, Jan. 11. Three-pointers: 33.1 percent. Free throws: 71.5. Garrison Matthews: 22.1 ppg., 5.5 rpg. Rob Marberry: 16.0 ppg., 5.8 rpg. Kenny Cooper: 9.9 ppg., 4.0 apg. This will be Lipscomb's first NCAA appearance. Matthews was the MVP of the Atlantic Sun championship with 33 points (7 of 14 from three-point range) and nine rebounds. The Bisons like to play an up-tempo game and led the Atlantic Sun in scoring, averaging 82.5 ppg. Record: 30-4, 14-4 Big East, 2nd. RPI: 2. Coach: Jay Wright (24th season, 538-250; 416-165 in 17 seasons at Villanova, 21-13 NCAA). Three-pointers: 39.5 percent. Free throws: 76.8. Jalen Brunson: 19.0 ppg., 4.8 apg. Mikal Bridges: 17.6 ppg., 5.5 rpg. Donte DiVincenzo: 13.8 ppg., 3.4 apg. The Wildcats were struck by multiple injuries this season, with four players missing a total of 27 games. They ended the regular season leading the nation in scoring at 87.2 points per game. Brunson, the Big East player of the year, has a knack for scoring when his team needs it. Freshman center Omari Spellman is second in the conference in blocked shots and third in three-point percentage. Record: 18-16, 10-8 Northeast, 4th, won conference tournament. RPI: 232. Coach Derek Kellogg (10th season, 173-153; 18-16 in first season at LIU Brooklyn; 0-1 NCAA). Best win: 71-67 at Wagner in the Northeast Conference final, March 6. Worst loss: 72-63 at Central Connecticut State, Jan. 20. Three-pointers: 34.5 percent. Free throws: 69.6. Joel Hernandez: 20.9 ppg., 5.9 rpg., 2.8 apg. Raiquan Clark: 17.4 ppg., 7.1 rpg. Jashaun Agosto: 11.7 ppg., 4.1 rpg., 4.1 apg. Hernandez, a 6-3 redshirt senior, had 32 points in the Northeast Conference championship win over Wagner, shooting 10 for 16 from the field (with one three) and 11 of 14 from the foul line while earning the NEC tournament MVP award. Kellogg took the Blackbirds to the NCAA tournament in his first season after being fired by UMass. The Blackbirds, who were seeded No. 4 in the NEC tournament, enter the NCAA tournament on a five-game winning streak. Record: 22-12, 12-6 Big South, 2nd. RPI: 128. Coach: Mike Jones (7th season, 115-115, all at Radford, 0-0 NCAA). Best win: 72-62 vs. UC-Davis, Dec. 23. Worst loss: 61-60 vs. High Point, Feb. 7. Three-pointers: 35.0 percent. Free throws: 72.3. Ed Polite Jr.: 13.5 ppg., 7.7 rpg. 1.9 spg. Carlik Jones: 11.8 ppg., 3.0 apg. The Highlanders earned their first NCAA trip since 2009 when Jones drilled a three-point basket at the buzzer for a 55-52 win over Liberty in the Big South tournament championship game. They allowed an average of 64.4 points per game, 15th in the nation. Donald Hicks led the team with 60 three-pointers and a 40.3 percent mark from beyond the arc. Record: 21-11, 10-8 Atlantic Coast, 7th. RPI: 61. Coach: Buzz Williams (11th season, 228-145; 75-59 in four seasons at Virginia Tech, 8-6 NCAA). Three-pointers: 39.0 percent. Free throws: 70.9. Justin Robinson: 13.8 ppg., 5.5 apg. Kenny Blackshear Jr.: 12.7 ppg., 6.0 rpg. The Hokies were one of two teams to defeat Virginia this season — the Cavaliers' only home loss — and also have a win over Duke. They have shot well, ranking eighth in the nation in field goal percentage at 50.0 percent. They also topped the ACC in hitting 39.0 percent of their three-point shots. Robinson is second in the conference in assists. Record: 19-15, 8-10 SEC, 9th. RPI: 42. Coach: Avery Johnson (3rd season, 56-45; 0-0 NCAA). Three-pointers: 32.3 percent. Free throws: 66.9 percent. Collin Sexton: 18.3 ppg., 3.6 rpg., 3.6 apg. Donta Hall: 10.9 ppg., 6.9 rpg., 53.5 ftpct. John Petty: 10.4 ppg., 36.8 3pct. Sexton beat Texas A&M at the buzzer and then dropped 31 on Auburn as the Crimson Tide sealed their NCAA bid by winning two games in the SEC tournament. Hall had a frightening fall in the Auburn game on Friday, banging his head on the floor. He did not play Saturday. Alabama lost five in a row to end the regular season and had nearly played its way out of the NCAAs. Avery Johnson played two games in the NCAA tournament for Southern U., including a 1987 loss to Temple when he was held to five points. He still shares the D-I single-game record of 22 assists. Record: 24-10, 11-7 Big 12, 3rd. RPI: 27. Coach: Bob Huggins (33rd season, 771-315; 253-129 in 11 seasons at West Virginia; 31-23 NCAA). Best win: 68-61 vs. Virginia, Dec. 5. Worst loss: 93-77 at Iowa State, Jan. 31. Three-pointers: 34.9 percent. Free throws: 76.7. Jevon Carter: 17.0 ppg., 4.8 rpg., 6.5 apg. Daxter Miles: Jr., 12.1 ppg., 2.8 rpg., 3.3 apg. Sagaba Konate: 10.8 ppg., 7.9 rpg., 3.3 bpg. The Mountaineers know how to put teams away, having led the Big 12 in the regular season in scoring margin (plus-11.5 ppg.). West Virginia applies relentless defensive pressure and led the Big 12 in steals per game (8.1) and turnover margin (plus-5.5). Konate, a 6-8 sophomore, was third nationally in blocked shots (3.3 per game) during the regular season. Record: 26-5, 16-2, Ohio Valley, 1st. RPI: 48. Coach: Matt McMahon (3rd season, all at MSU, 59-36; 0-0 NCAA). Best win: 68-51 vs. Belmont in OVC title game, March 3. Worst loss: 69-55 at St. Louis, Dec. 12. Three-pointers: 37.9 percent. Free throws: 73.0. Jonathan Stark: 21.8 ppg., 3.9 ast., 41.0 3pct. Terrell Miller Jr.: 14.7 ppg., 8.3 rpg. Ja Morant: 12.7 ppg., 6.6 rpg., 6.4 ast. They last played on March 3 and were the first team to officially punch its NCAA ticket. The Racers have won 13 in a row. They nearly upset Auburn in December. Stark was the conference player of the year. He spent his first two seasons at Tulane and has 2,222 career points. This will be his first NCAA tournament game. The only freshman averaging more assists per game than Morant is Oklahoma's Trae Young. Murray State (2012) is the last OVC team to win an NCAA tournament game. The sixth-seeded Racers beat Colorado State before losing to Marquette, a 3-seed. Record: 25-7, 14-4 American, 2nd. RPI: 16. Coach: Gregg Marshall (20th season, 480-180; 286-97 in 11 seasons at Wichita State; 11-13 NCAA). Best win: 76-72 at Cincinnati, Feb. 18. Worst loss: 83-78 vs. SMU, Jan. 17. Three-pointers: 38.6 percent. Free throws: 73.5. Landry Shamet: 14.6 ppg., 5.2 apg. Shaquille Morris: 14.2 ppg., 5.5 rpg. Darral Willis Jr.: 10.6 ppg., 6.0 rpg. 1.6 bpg. After losing a total of four games in the Missouri Valley Conference the previous four seasons, Wichita State lost four in its first season in the AAC. Each of the last six regular-season games was decided by seven points or fewer, with the Shockers winning six of them. Shamet, a 6-4 redshirt sophomore who was a first-team all-conference choice, is one of the top all-around players in the AAC on both ends of the court. Record: 24-10, 12-6 USA, 4th. RPI: 87. Coach: Dan D'Antoni (4th season, 72-60, all at Marshall, 0-0 NCAA). Three-pointers: 35.1 percent. Free throws: 76.3. Jon Elmore: 22.5 ppg., 6.0 rpg., 6.9 apg. Ajdin Penava: 15.6 ppg., 8.5 rpg., 4.2 bpg. The Thundering Herd's fast-paced offense has accounted for 84.8 points per game, ninth in NCAA Division I, and a love for three-point baskets (9.8 per game). Elmore fills the stat sheet — ninth in the nation in scoring average and assists, fifth in free throws made (208), and third in minutes played (38.2 per game). Penava, a 6-9 junior, leads the nation in blocked shots. Record: 20-12, 13-5 Southeastern, 1st. RPI: 46. Coach: Mike White (6th season, 169-76; 68-36 in three seasons at Florida; 3-1 NCAA). Three-pointers: 37.4 percent. Free throws: 72.0. Jalen Hudson: 15.6 ppg., 3.9 rpg., 41.1 3pct. Egor Koulechov: 13.8 ppg., 6.5 rpg., 40.8 3pct. KeVaughn Allen: 11.3 ppg., 2.3 apg., 92.3 ftpct. Hudson went to the same Ohio high school (St. Vincent-St. Mary) as LeBron James. He had 35 in a wild double-overtime win against Gonzaga in November. Senior point guard Chris Chiozza is the Gators' all-time leader in assists. He hit a buzzer-beater against Wisconsin in the Sweet 16 last year. Chiozza has an outstanding 3.3 assist-turnover ratio and also was named to the SEC's all-defensive team. Koulechov was born in Russia, raised in Israel, went to high school in Florida, and played for Arizona State and Rice before arriving in Gainesville as a graduate transfer. Florida guard Jalen Hudson (3) makes a dunk on a fast break. Record: 21-11, 11-7 Pac 12, 3rd. RPI: 36. Coach: Steve Alford (23rd season, 502-262; 117-56 in 5 seasons at UCLA; 11-10 NCAA). Best win: 82-74 at Arizona, Feb. 9. Worst loss: 69-63 at Oregon State, Jan. 18. Three-pointers: 38.6 percent. Free throws: 72.2. Aaron Holiday: 20.1 ppg, 3.6 rpg, 5.8 apg. Kris Wilkes: 14 ppg, 5 rpg, 1.7 apg. Thomas Welsh: 12.7 ppg, 10.5 rpg, 1.4 apg. This Bruins team isn't quite what last year's 30-win team was, but Aaron Holiday has led UCLA to a decent season in the Pac-12. Holiday, younger brother of former Sixer Jrue, leads the team in minutes, points, assists, and steals. Record: 24-5, 14-4 Atlantic Ten, 2nd. RPI: 24. Coach: Mark Schimdt (17th season, 270-240; 189-150 in 11 seasons at St. Bonaventure; 0-1 NCAA). Best win: 77-74 vs. Rhode Island, Feb. 16. Worst loss: 77-75 vs. Niagara. Three-pointers: 39.7 percent. Free throws: 76.5. Jaylen Adams: 20.5 ppg., 3.6 rpg., 5.5 apg. Matt Mobley: 18.2 ppg., 5.1 rpg., 2.5 apg. Courtney Stockard: 12.6 ppg., 6.5 rpg. The Bonnies finished the regular season on a 12-game winning streak. They led the Atlantic-10 in points per game (78.0) but that only ranked 72nd nationally. The Wildcats lost two key players from their national championship team but kept rolling thanks to fine play at both ends of the floor, led by Hart, the Big East player of the year. They ended the regular season second in the nation in free-throw percentage, ninth in field goal percentage (49.6), and 20th in points allowed (63.1). Record: 24-9, 11-1 Big 12, 2nd. RPI: 23. Coach: Chris Beard (3rd season, 72-28; 42-23 in two seasons at Texas Tech; 1-1 NCAA). Best win: 85-73 at Kansas, Jan. 2. Worst loss: 70-52 at Iowa State, Jan. 20. Three-pointers: 36.0 percent. Free throws: 70.7. Keenan Evans: 17.4 ppg., 3.1 rpg., 3.3 apg. Zhaire Smith: 11.5 ppg., 4.7 rpg., 1.1 bpg. Jarrett Culver: 11.5 ppg., 4.6 rpg., 1.8 apg. Beard is one of the rising coaches, after taking Arkansas Little Rock to the NCAA tournament in 2016, he has Texas Tech there in his second season. The Red Raiders finished No. 1 in the Big 12 regular season in scoring defense, allowing 64.5 points per game and topping the league in field-goal percentage defense (.402) and three-point percentage defense (.321). The Red Raiders ended a four-game losing streak by beating TCU, 79-75 in their regular season finale. Record: 28-6, 14-4, Southland, 3th. RPI: 104. Coach: Kyle Keller (2nd season, 46-21; 0-0 NCAA). Three-pointers: 37.2 percent. Free throws: 70.5. Junior forward T.J. Holyfield leads the team in rebounding and averages 1.3 blocks per game, but he can also shoot it. He averages two three-point attempts per game and is making more than 40 percent of them. Record: 23-11, 10-8 Southeastern, 6th. RPI: 30. Coach: Mike Anderson (16th season, 351-183; 151-85 in six seasons at Arkansas; 9-8 NCAA). Three-pointers: 40.2 percent. Free throws: 67.0. Jaylen Barford: 17.9 ppg., 3.9 rpg., 43.4 3pct. Daryl Macon: 17.1 ppg., 4.0 apg., 43.8 3pct. Daniel Gafford: 12.1 ppg., 6.2 rpg., 2.2 bpg. They start three senior guards — Barford, Macon, and Anton Beard — which is never a bad thing in the NCAAs. Arkanas hit 40.2 percent of its three-point attempts during the regular season, third among power-conference schools behind Purdue (42.0) and Michigan State (41.3). Gafford, a 6-foot-11 freshman, had 68 dunks in the regular season, more than six SEC teams had total. Anderson is one of four coaches with at least 15 years experience to never have had a losing season. Roy Williams, Tom Izzo, and Mark Few are the others. Record: 20-13, 9-9 Big East, tied for 6th. RPI: 41. Coach: LaVell Jordan (2nd season, 31-37; 20-13 in one season at Butler, 0-0 NCAA). Three-pointers: 36.0 percent. Free throws: 77.4. Kelen Martin: 21.2 ppg., 6.4 rpg. Kamar Baldwin: 15.0 ppg., 4.9 rpg. The Bulldogs lost five of their last seven regular-season games, averaging 84.6 points allowed in the losses. Martin, a unanimous All-Big East selection, shoots 85.8 percent on free throws and averages 35.4 minutes per game. Forward Tyler Wideman led the conference in field-goal percentage at 66.9 percent. Jorgensen, who hit 57 threes, is one of the league's best freshmen. Record: 28-6, 15-3 Big Ten, 2nd. RPI: 9. Coach: Matt Painter (14th season, 318-153; 293-148 in 13 seasons at Purdue; 11-10 NCAA). Best win: 70-69 at Michigan, Jan. 9. Worst loss: 57-53 at Wisconsin, Feb. 15. Three-pointers: 42.0 percent. Free throws: 74.3. Carsen Edwards: 18.5 ppg., 3.0 rpg., 1.2 spg. Dakota Mathias: 12.4 ppg., 4.1 apg. 4.1 rpg. Vincent Edwards: 14.5 ppg., 7.3 rpg. Led by the "Edwards Boys" – no relationship – the 10th-ranked Boilermakers have been consistent, losing just two games to teams outside of the Top 50 RPI. Purdue shares the wealth, averaging 16.7 assists, which ranks 21st in the country. Record: 20-11, 10-6 Big West, 4th. RPI: 131. Coach: Dedrique Taylor (5th season, 67-88, all at Fullerton). Three-pointers: 33.8 percent. Free throws: 73.4. Kyle Allman: 19.4 ppg., 43.0 3pct. Khalil Ahmad: 153. ppg., 82.9 ftpct. Jackson Rowe: 12.2 ppg., 6.8 rpg. Allman had 26 points in the championship game to claim tourney MVP. He's from Brooklyn, some 2,400 miles from Fullerton, Cal. Austen Awosika, one of the five who've started every game for the Titans, was a high school teammate of Lonzo Ball. CSF's non-conference losses include USC, Saint Mary's, Georgia and Cal (in overtime). Record: 27-7, 13-5 Big 12, 1st. RPI: 5. Coach: Bill Self (25th season, 650-200; 443-95 in 15 seasons at Kansas; 43-18 NCAA). Best win: 65-61 vs. Kentucky, Nov. 14 in Chicago. Worst loss: 82-64 at Oklahoma State, March 3. Three-pointers: 39.8 percent. Free throws: 69.9. Devonte' Graham: 17.6 ppg., 4.0 rpg., 7.2 apg. Sviatoslav Mykhailiuk: 15.3 ppg., 4.1 rpg., 45.1 pct. three-point. Udoka Azubuike: 13.7 ppg., 7.1 rpg., 1.7 bpg. This has not been as dominating a Kansas team as in recent past, but the Jayhawks still won their 14th consecutive Big 12 title, the longest streak in NCAA history. The Jayhawks led the Big 12 in three-point field goals made (10 per game) and were second in percentage (.398) during the regular season. Azubuike, who led the nation in field goal percentage (.774) during the regular season, missed the Big 12 tournament with a sprained knee. Record: 24-8, 12-2 Ivy, tied for 1st. RPI: 115: Coach Steve Donahue (17th season, 248-254; 48-40 in three seasons at Penn; 2-3 NCAA). Best win: 74-71 vs. Harvard, Feb. 24. Worst loss: 80-79 at Yale, March 2. Three-pointers: 34.8 percent. Free throws: 65.6. AJ Brodeur: 12.6 ppg., 6.9 rpg. Ryan Betley: 14.7 ppg., .444 three-point. Darnell Foreman: 10.4 ppg., 3.6 apg., 1.1 spg. Penn led the Ivy League in rebounding during the regular season, averaging 37.7 per game. The Quakers shared the regular-season Ivy League title with Harvard, their 26th overall and first under Donahue, who was named Ivy League coach of the year. Inconsistent free throw shooting has hurt Penn, which was last in the Ivy League during the regular season at 65.6 percent. Penn forward AJ Brodeur (25) attempts a shot against Yale forward Blake Reynolds (32). Record: 21-11, 10-8 Big East, tied for 3rd. RPI: 31. Coach: Kevin Willard (11th season, 194-162; 149-113 in eight seasons at Seton Hall, 0-2 NCAA). Best win: 89-79 vs. Texas Tech, Nov. 30. Worst loss: 71-65 vs. Rutgers, Dec. 16. Three-pointers: 36.0 percent. Free throws: 69.0. Angel Delgado: 13.4 ppg., 11.6 rpg. The Pirates won four of their last five regular-season games after a season-high four-game losing streak. Powell, named the Big East's most improved player, led the Pirates in three-point shooting at 38.4 percent and knocked down 2.8 baskets per game. Delgado, who was slowed by an achy knee late in the season, won the conference rebound title for the second straight year. Record: 21-11, 11-7 Atlantic Coast, tied for 3rd. RPI: 64. Coach: Kevin Keatts (4th season, 93-29; 21-11 in one season at North Carolina State; 0-2 NCAA). Best win: 96-85 vs. Duke, Jan. 6. Worst loss: 64-60 vs. Northern Iowa, Nov. 23. Three-pointers: 36.7 percent. Free throws: 70.3. Torin Dorn: 13.8 ppg., 6.3 rpg. Omer Yurtseven: 13.6 ppg., 6.8 rpg. The Wolfpack lead the ACC in turnovers forced with 15.2 per game and in steals at 7.61, but are last in field-goal percentage defense at 46.3. Sophomore Markell Johnson leads the ACC in assists with a 7.4 average and is tied for third in steals at 1.72. Yurtseven, a 7-foot sophomore center from Turkey, shot 57.6 percent from the floor and blocked 1.88 shots per game. Record: 23-9, 11-7 Atlantic Coast, tied for 3rd. RPI: 11. Coach: Brad Brownell (16th season, 314-197; 147-112 in eight seasons at Clemson; 1-4 NCAA). Best win: 82-78 vs. North Carolina, Jan. 30. Worst loss: 65-58 to Virginia Tech, Feb. 21. Three-pointers: 37.0 percent. Free throws: 74.8. Marcquise Reed: 15.9 ppg., 4.6 rpg., 3.4 apg., 1.7 spg. Gabe DeVoe: 13.2 ppg., 4.7 rpg. Shelton Mitchell: 12.0 ppg., 3.5 apg. The Tigers set a program record for most ACC wins with 11, but went 2-4 in their last six regular-season games. Senior forward Donte Grantham, the team's No. 2 scorer and rebounder, suffered a season-ending torn anterior cruciate ligament in his knee in January. Elijah Thomas, a 6-9 junior, leads the team in rebounds (7.9 per game) and blocked shots (2.2 per game). Record: 28-5, 12-2 Western, 1st. RPI: 35. Coach: Chris Jans (second season, 49-17; 28-5 in one season at New Mexico State; 0-0 NCAA). Best win: 63-54 vs. Miami in Hawaii, Dec. 23. Worst loss: 73-63 OT at Seattle, Feb. 17. Three-pointers: 32.0 percent. Free throws: 63.6. Zach Lofton: 19.8 ppg., 5.1 rpg. Jemerrio Jones: 11.0 ppg., 13.2 rpg., 3.1 apg. Eli Chuha: 9.6 ppg., 4.9 rpg. The Aggies are not a good shooting team and rely on defense and getting in transition. They led the WAC in scoring defense (63.2 ppg.) and in field goal percentage defense (.392). Jones, a 6-5 senior, was the WAC player of the year and was second nationally in rebounding prior to the conference tournament. Record: 25-7, 13-5 Southeastern, 1st. RPI: 15. Coach: Bruce Pearl (14th season, 300-160; 69-61 in four seasons at Auburn; 10-8 NCAA). Best win: 94-84 at Tennessee, Jan. 2. Worst loss: 88-74 vs. Temple, Nov. 17. Three-pointers: 37.1 percent. Free throws: 78.9. Mustapha Heron: 16.6 ppg., 5.5 rpg., 80.7 ft pct. Bryce Brown: 16.2 ppg., 38.7 3-pt. pct. Jared Harper: 13.7 ppg., 5.7 apg. They won a piece of an SEC regular-season crown for the first time since 1999 and is in the NCAAs for the first time since 2003. The sweeping FBI probe into college basketball corruption resulted in the firing of assistant coach Chuck Person, who has been indicted. Forward Horace Spencer (4.3 ppg.) is a Philly native who went to William Tennent High in Warminster for two years. Record: 26-7, 14-4 Colonial, 1st place. RPI: 57. Coach: Earl Grant (4th season, 77-55; 0-0 NCAA). Best win: 83-76 OT vs. Northeastern in conference final. Worst loss: 87-82 OT at Drexel, Jan. 5. Three-pointers: 36.4 percent. Free throws: 75.9. Grant Riller: 18.7 ppg., 2.1 apg., 40.3 3-pt. pct. Joe Chealey: 18.5 ppg., 3.6 apg., 86.1 ft pct. Jarrell Brantley: 17.0 ppg., 7.1 rpg. Chealey, a fifth-year senior, had 32 points in the CAA title game and cried afterward, perhaps remembering the 9-24 season in 2014-15. Chealey had eight points in the final 77 seconds against Northeastern to help force the overtime. They start two seniors, two juniors and a sophomore (Riller). The last CAA team to win an NCAA game is Virginia Commonwealth in 2012. The Cougars are making their first NCAA appearance since 1999. Record: 21-11, 9-9 Big 12, 5th. RPI: 26. Coach: Jamie Dixon (20th season, 373-149; 45-26 in two seasons at TCU; 12-11 NCAA). Best win: 82-73 vs West Virginia, Jan. 22. Worst loss: 81-78 at Vanderbilt, Jan. 27. Three-pointers: 40.0 percent. Free throws: 71.2. Vladimir Brodziansky: 15.1 ppg., 5.1 rpg., 1.6 bpg. Kenrich Williams: 13.1 ppg., 9.3 rpg., 4.0 apg. Desmond Bane: 12.8 ppg., 4.1 rpg. In the second season under Dixon, the Horned Frogs are making their first NCAA appearance since 1998. TCU has been competitive in most games — of their nine conference losses, seven were by six points or fewer. Brodziansky, a 6-11 senior from Slovakia who played one season at Pratt Community College, had 1,338 career points in three seasons at TCU, through the regular season. Record: 20-11, 8-10, PAC 12, 9th. RPI: 66. Coach: Bobby Hurley (third season, 157-93; 95-51 in 3 seasons at Arizona State; 0-1 NCAA). Best win: 95-85 at Kansas, Dec. 10. Worst loss: 90-81 at Colorado, Jan. 5. Three-pointers: 36.2 percent. Free throws: 74.3. Shannon Evans II: 16.6 ppg, 3.2 rpg, 3.5 apg. Romello White: 10.7 ppg, 7.2 rpg, 0.4 apg. Bobby Hurley's third iteration of the Sun Devils is his best one, and few teams have more impressive non-conference wins. But, after a hot start, they haven't looked as impressive on a night-to-night basis, which led to an unimpressive 8-10 conference record. Their highs have been as high as anyone, but their conference record leaves them leaning heavily on their upset wins over Xavier and Kansas for a case to believe. Record: 20-13, 8-10 Atlantic Coast, tied for 10th. RPI: 45. Coach: Jim Boeheim (42nd season, 923-370; 57-31 NCAA). Best win: 62-55 vs. Miami, Feb. 17. Worst loss: 55-51 vs. Georgia Tech, Jan. 31. Three-pointers: 32.1 percent. Free throws: 74.0. Tyus Battle: 19.8 ppg., ppg, 3.1 rpg, 1.9 apg. Frank Howard: 15.0 ppg., 5.0 apg., 1.9 spg. Oshae Brissett: 14.7 ppg., 8.8 rpg. The Orange needed a late run to avoid missing the NCAAs for the third time in the last four seasons. With a thin bench, the 73-year-old Boeheim played Battle, Howard and Brissett major minutes — they ranked first, third and sixth, respectively, in Division I for minutes. Syracuse was second in the ACC with 64.1 points per game allowed and 39.4 percent field goal defense. Record: 29-4, 16-2 Big Ten, 1st. RPI: 14. Coach: Tom Izzo (573-224; 47-19 NCAA). Best win: 63-45 vs. North Carolina, Nov. 26. Worst loss: 75-64 vs. Michigan in Big Ten Tournament. Three-pointers: 41.3 percent. Free throws: 75.1. Miles Bridges: 16.9 ppg., 6.9 rpg. Cassius Winston: 12.6 ppg., 6.8 apg., 52.6 3-pt pct. Jaren Jackson Jr.: 11.3 ppg., 5.8 rpg., 3.2 bpg. The Spartans have all the tools necessary to win their first national championship since 2000. Jackson, a 6-11 freshman, is a potential Top-5 NBA draft pick and Bridges is likely a lottery pick. The question is what happens when the Spartans meet up with another "alpha dog." MSU had a strength of schedule rated 101st and went 2-4 against teams in the Top 50 RPI. Record: 25-9, 16-2 Patriot, 1st. RPI: 80. Coach: Nathan Davis (third season, 68-32; 0-1 NCAA). Best win: 83-54 vs. Colgate in the Patriot League championship, March 7. Worst loss: 84-79 vs. Boston University on Jan. 2. Three-pointers: 34.3 percent. Free throws: 71.8. Zach Thomas: 20.3 ppg., 9.2 rpg. Nana Foulland: 15.4 ppg., 7.1 rpg., 1.8 bpg. Stephen Brown: 14.9 ppg., 3.4 rpg., 4.3 apg. Bucknell enters the NCAA tournament winner of eight in a row and 18 of 19. Thomas, a 6-7 senior forward, was the Patriot League player of the year. He was joined on the first-team all-conference team by Foulland, a 6-9 senior, and Brown, a 5-11 senior. In the championship win over Colgate, Brown had 22 points and six assists for the Bison, who led the Patriot League in scoring (81.1 ppg.). Record: 23-6, 15-3 Atlantic 10, 1st. RPI: 19. Coach: Danny Hurley (7th season, 147-102; 109-79 in six seasons at Rhode Island; 1-1 NCAA). Best win: 75-74 vs. Seton Hall, Nov. 23 in Brooklyn. Worst loss: 78-48 vs. St. Joseph's, Feb. 27. Jared Terrell: 17.5 ppg., 3.4 rpg., 2.4 apg. E.C. Matthews: 12.8 ppg., 3.8 rpg. Jeff Dowtin: 9.7 ppg., 5.6 apg., 3.2 rpg. The 25th-ranked Rams used a 16-game winning streak during the season to win their first outright regular-season title. Terrell is the biggest scoring threat but Dowtin and Matthews are capable of putting up big numbers in any particular game. The Rams don't have a player taller than 6-8 in the normal rotation and that contributes to their rebounding percentage (34.0) being 246th in the nation. Record: 18-13, 8-10 Big 12, 6th. RPI: 49. Coach: Lon Kruger (32nd season, 619-394; 140-90 in seven seasons at Oklahoma; 20-17 NCAA). Best win: 85-80 vs. Kansas, Jan. 23. Worst loss: 88-80 at Iowa State, Feb. 10. Three-pointers: 36.4 percent. Free throws: 75.2. Christian James: 12.1 ppg., 4.3 rpg. Brady Manek: 10.4 ppg., 5.1 rpg. This team is so dependent on Young, a freshman point guard, who led the nation in scoring and assists in the regular season. The Sooners slumped with a late-season six-game losing streak before winning two of their final three in the regular season. Oklahoma likes to play an up-tempo game and was fourth nationally in scoring (86 ppg.) during the regular season. Record: 26-7, 15-3 Atlantic Coast, 2nd. RPI: 7. Coach: Mike Krzyzewski (43rd season, 1,097-337; 1,024-278 in 38 seasons at Duke; 91-28 NCAA). Best win: 66-57 vs. Clemson, Feb. 18. Worst loss: 89-84 vs. Boston College, Dec. 9. Three-pointers: 38.0 percent. Free throws: 70.5. Marvin Bagley III: 21.1 ppg., 11.5 rpg. Grayson Allen: 15.7 ppg., 4.5 apg., 1.7 spg. Wendell Carter Jr.: 13.8 ppg., 9.3 rpg. The 6-foot-11 Bagley, a freshman, leads the ACC in scoring, rebounding, field goal percentage (.604) and offensive rebounds (3.9 per game). Freshman Gary Trent Jr. is shooting 42.3 percent from three-point range and has teamed with Allen to provide a strong 1-2 punch from beyond the arc. Duke has tightened up its defense in recent weeks, holding conference opponents to less than 40 percent shooting in ACC games. Record: 20-13, 11-7 Metro Atlantic, 4th. RPI: 107. Coach: Tim Cluess (13th season, 299-124; 182-91 in eight seasons at Iona; 0-4 NCAA). Best win: 83-71 vs. Fairfield in MAAC championship game, March 5. Worst loss: 82-78 at Sienna, Feb. 12. Three-pointers: 38.9 percent. Free throws: 73.3. Rickey McGill: 13.5 ppg., 5.6 apg. Roland Griffin: 10.9 ppg., 5.2 rpg., 52.1 FG pct. E.J. Crawford: 12.9 ppg., 3.5 rpg. The Gaels took advantage of top seeds Rider and Canisius getting upset and won their third consecutive Metro Atlantic tournament. Griffin scored a career-high 29 and Zach Lewis added 20 points. With five players averaging double-digit scoring, the Gaels rank 50th in points per game (79.8), but also rank 276th in points allowed (76.3). That's a bad mix for a 15th seed.